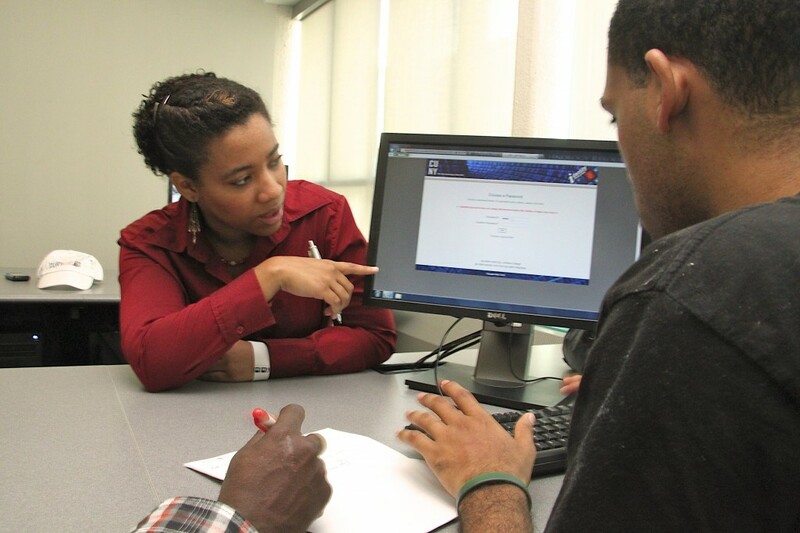 Brenia De La Cruz, who leads the student marketing team, shows a fellow student one of the features of CUNYfirst. The pace is accelerating behind the scene, as more administrators and staff are involved in learning and testing the various CUNYfirst systems that are expected to launch at Lehman later this semester. The schedule currently calls for in-person and online training for faculty and staff to begin in mid-October and for the system itself to go live in early November. Web grading for the fall semester is expected to be handled through the new system, and so is registration for both the winter and spring sessions. Members of the team from five administrative offices meet to plan for the implementation of CUNYfirst at Lehman. Shown are administrators and staff from the Bursar, Admissions, Registrar, Financial Aid, and Information Technology offices, in addition to Jay Mercado (standing, third from left), who is coordinating the effort at Lehman, and Johnny Zephyr (standing, second from left), one of the CUNYfirst trainers. Once a faculty or staff member has a CUNYfirst account, s/he will be able to check the personal data stored in the system, such as their marital status, which may have changed since they first came to Lehman. Visit Claim Your Account for instructions on how to claim your account and visit Activate Your Account to activate your account. Students will be able to claim their accounts in mid-November. Ultimately, students will use the system to see their financial aid information, pay their Lehman bills, register for courses, look up their grades, change their address, drop a class, and see if a class they’re interested in is already filled. “I also encourage everyone to periodically visit Lehman’s CUNYfirst site and be proactive,” Mercado said, citing the glossary of terms posted on the site, which introduces new terminology that replaces words and phrases currently used. As an example, he explaines that “the system does not use the word ‘major’. Instead it’s a ‘plan’. Data from student records, financial aid, and admissions have been converted into the new system and are now being validated by Lehman and CUNYfirst staff, who are also testing the new tools. “This is our last test drive on the car before we own it,” Mercado noted. The training approach being used calls for a cadre of trainers from Lehman to then teach their colleagues, including staff in the Bursar’s Office, Admissions, the Registrar’s Office, Financial Aid, Information Technology Resources, and the Testing Office. All the trainers are now completing a refresher course to bring them up to date on any recent changes made to the systems. Help Desk/Training/Security liaisons Youssry Youssef and Johnny Zephyr are coordinating the training effort at Lehman. Faculty and staff not normally listed in the College’s Human Resources records, such as those on the Research Foundation payroll, are being added to the system to give them access to CUNYfirst programs they need for their work. Arrangements are being finalized for a Help Desk that will operate in the East Dining Room for about three months, from December through February. Both trained staff and peer-support groups will be on hand.